Did Ivanka Trump create ‘millions’ of jobs? These remarks from the president raised eyebrows — and inquiries from readers. The U.S. economy has added almost 4.9 million jobs since Trump became president, but regular readers know we would frown on the idea that any president himself “created” these jobs. Now, he says his daughter Ivanka Trump created jobs. What is he talking about? The president, as he noted a few moments later, was referring to the White House’s “Pledge to America’s Workers.” Under the auspices of a workforce policy advisory board co-chaired by Ivanka Trump, about 200 companies have pledged to offer more than 6.5 million training opportunities to workers over the next five years. The United States lags behind many other industrialized nations in the efforts it devotes to skill training and reskilling workers, so it’s an important issue. The White House has a snazzy Web page to promote the list of companies. No, it’s not. Training opportunities are not new jobs. In fact, as CNN has documented, many of these companies and organizations were already planning to offer these retraining programs. It’s good that the White House has gotten the numbers on record. But it’s not the same thing as something new. For instance, the Associated General Contractors of America, a construction industry trade association, is listed as pledging 172,500 opportunities. AGC chapters will enroll 6,000 apprentices a year in apprenticeship training programs, for a five-year total of 30,000. Chapters also will enroll 15,000 workers a year in new-skills construction training programs, or 75,000 over the five-year period. The AGC will enroll 12,500 construction workers a year, or 62,500 over five years, in a mix of upskilling programs, including training in construction supervision, building information modeling and Lean construction, that member firms will pay for. And the AGC will enroll 1,000 workers a year in AGC safety training programs, with the cost of 700 paid through a Labor Department grant. Meanwhile, Associated Builders and Contractors pledged 500,000 opportunities, which compares with 476,000 trained currently on an annual basis. CNN identified other existing programs, such as at General Motors (a program that started in 2016), FedEx, Walmart and the Society for Human Resource Management. We sought comment from Ivanka Trump’s office and the White House but did not hear back. Update: In response to this fact check, a White House official said that Ivanka Trump’s efforts also include winning the reauthorization of the Carl D. Perkins Career and Technical Education Act, making more than $1 billion available for career education programs and reaching more than 11 million students, a presidential directive telling the Department of Education to devote at least $200 million in grants annually to the promotion of high-quality STEM education and the release of a 5-year STEM strategic plan to coordinate resources and programming across the federal government to improve STEM education. “Thanks to Ivanka’s leadership of the office of economic initiatives millions of opportunities have been created for America’s workers both by legislative and administration action including Perkins CTE, tax reform, the National Council for the American Worker and the 6.5 million opportunities for career enhancement, continuing education, and on-the-job training pledged by 200 companies the private sector for American students and workers,” the official said in a statement. Ivanka Trump can certainly be congratulated for getting so many companies to put their names in writing and pledge to train workers. Yet these are not new jobs but training opportunities. Moreover, the numbers reflect pledges over a five-year period, not something already achieved, as the president framed it. Unlike many of the president’s statements, there are at least real numbers attached, but his claim is still a real stretch. 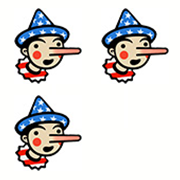 Trump may be a proud father, but he earns Three Pinocchios. "My daughter has created millions of jobs."